Sufi Dar Trust was established under Dadaji’s inspiration and able guidance as a humble dedication to Puj Shahenshah Baba Nebhraj Sahib. First, he set up a small temple on Waltax Road, Chennai, where 30 to 40 devotees would regularly join the fellowship gatherings. As the congregation of devotees grew, Dadaji shifted the temple to its present site in Mylapore, Chennai. Puj Shahenshah Baba keeps showering his blessings upon all those who come to him seeking solutions to their problems. He also keeps alleviating their miseries and guiding them through his chosen disciple, Pujniya Dada Ratanchandji. As one enters the Sufi Dar, one is overwhelmed by the atmosphere of sanctity that prevails there. Pictures of several Sufi saints, Hindu saints and mystics, Jesus Christ and Mother Mary, Guru Nanak and other Sikh gurus, religious leaders of Radhaswami and Chidakashi sects and Sai Baba adorn the walls of Sufi Dar. Marble statues of Lord Ganesh, Laxmi Narayan, Shiva Parvati, Radha Krishna, Lord Ram, Sita, Laxman, Hanuman, Durga Mata and Jhulelal Sain are tastefully arranged and placed there. Every visitor, irrespective of his faith, is sure to behold his favourite deity and feel at home in Sufi Dar. 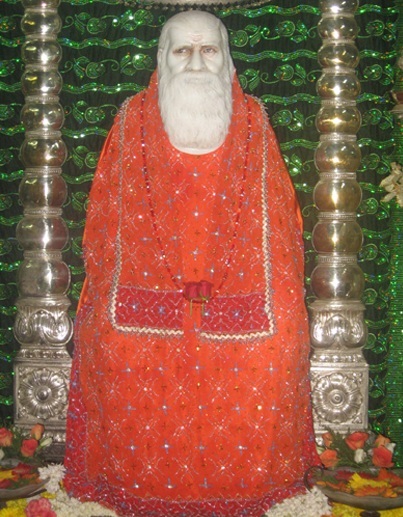 Pictures of several Sufi saints, Hindu saints and mystics, Jesus Christ and Mother Mary, Guru Nanak and other Sikh gurus, religious leaders of Radhaswami and Chidakashi sects and Sai Baba adorn the walls of Sufi Dar. Marble statues of Lord Ganesh, Laxmi Narayan, Shiva Parvati, Radha Krishna, Lord Ram, Sita, Laxman, Hanuman, Durga Mata and Jhulelal Sain are tastefully arranged and placed there. Every visitor, irrespective of his faith, is sure to behold his favourite deity and feel at home in Sufi Dar.